This information is generally accepted for all motorcycles. Motorcycle carburetion is fairly complex, but a basic understanding of the parts and theory involved will go a long way to simplify the processes and make fine-tuning your carburetor much less intimidating. Right off the bat I’m going to say this is only intended to be a very basic explanation. Motorcycle carburetion is quite complex with a number of circuits and conditions acting together to deliver a measured amount of gasoline and air to your engine. Most of which aren’t even mentioned here. To do it justice you would literally have to write a book and that’s not my goal here. Information from a 1988 to 2000 KDX200/220 Keihin PWK is illustrated here but the principals are the same for all KDXs. Pressure can be your friend. Your KDX relays on differences in air pressure to deliver a charge of gasoline and air into the engine. If you measured the force applied by a column of air above the Earth you’d find that it exerts about 15 pounds of pressure per square inch at sea level. This pressure is referred to as atmospheric pressure and varies slightly with altitude, meteorological (weather) conditions etc. but we’ll talk about that later. Air, gasoline etc. will move from an area of higher pressure to an area of lower pressure until both are equal. How does your engine produce a pressure differential? As the piston moves past bottom dead center ( its lowest point ) and back up towards top dead center ( its highest point ) the pressure above the cylinder increases and the pressure below the cylinder decreases. 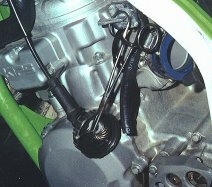 The reduced pressure inside the crankcase causes the reed valve to open and outside air, at a higher pressure, to flow through the carburetor delivering a charge for gasoline and air to the engine’s crankcase, which is at a lower pressure. Great so we know how air is drawn through the carburetor and into crankcase but what about the carburetor how is gasoline combined with the incoming charge of air? Some times restrictions can be a good thing. If you place a restriction in the path of a flowing liquid or gas a drop in pressure is created. The pressure before the restriction will be greater than the pressure after the restriction. Yup we’re back to that pressure differential thing again. Since the charge of incoming air must pass through the horn shaped mouth of the carburetor and into the smaller venturi ( a restriction ), the pressure before the venturi is higher than after. Such a reduction in pressure will cause an increase in the airs velocity because the same amount of airflow must take place before the restriction as after it. Velocity will vary directly with the amount of flow, and as the flow increases a greater pressure differential will occur across the venturi. Ok, so we know that as air is drawn into the carburetor and meets the restriction imposed by the venturi a pressure differential is created. The atmospheric pressure outside the carburetor is greater than the pressure inside the carburetor. So why do you care? Because the carburetor’s float bowl is vented directly to the outside atmosphere (higher pressure) and connected to the venturi (lower pressure) via the pilot circuit and the needle jet/ spray bar ( through the main jet ) that’s why. If we remember that a liquid, gas etc. will move from an area of higher pressure to an area of lower pressure until both are equal we can see how gasoline is introduced into the incoming charge of air. In this case gasoline is forced from the float bowl up through the pilot and main jet into the carburetor’s bore where it is delivered to the crankcase. When people talk about jetting a carburetor, tuning a carburetor or “breaking out the brass” they’re talking about manipulating the carburetor’s 4 main circuits to optimize gasoline delivery and therefore engine performance. They might adjust the air screw, adjust the jet needle’s clip position or exchanging the pilot (slow) jet, main jet, throttle valve (slide) or jet needle for one of an appropriate size. A perfectly tuned 2-stroke engine/carburetor delivers a 12.5 to 1 air to fuel ratio. No jet acts independently of the others but rather they work together to deliver gasoline to the engine. They do however target specific throttle openings and have the most effect is that area. See below. The air screw is most effective between idle through 1/8 throttle. The pilot (slow) jet is most effective between 1/8 through 1/4 throttle. The slide valve is most effective between 1/8 through 1/2 throttle. 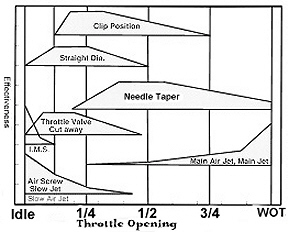 The jet needle is most effective between 1/4 through 3/4 throttle. The main jet is most effective between 3/4 through wide-open throttle. Before we get into the different parts of the carburetor and how they effect gasoline delivery I want to stop for a second and define the terms RICHER and LEANER. I know these terms can cause some trouble for those who are new to the sport or new to carburetor tuning and they are often used incorrectly. The terms RICHER and LEANER refer to the amount of GASOLINE being delivered to the engine and not the amount of oil. If you’ve done a plug reading at wide open throttle and the plug indicates you are running rich ( dark brown to black ) this is an indication that too much gas is being delivered to the engine and not too much oil. I know there are people that will say “You’re running too rich, try to change your premix ration from 42 parts gas: 1 part oil ( 42:1 ) to 50 parts gas : 1 part oil, that should lean things out a little “. This is in fact increasing the amount of gasoline ( 8 more parts of gas for each part of oil ) and causing the engine to run RICHER rather than leaner. If you remember richer and leaner are referring to the amount of gasoline being delivered this will all make much more sense. The pilot, or slow circuit, can be adjusted by manipulating two parts: the air screw and the pilot jet. The air screw controls the flow of air into the circuit. Turning the air screw clockwise reduces the air flow and richens the circuit. Turning it counter clockwise increases the airflow and leans the circuit. You can therefore use the air screw to fine tune the pilot circuit. The pilot jet restricts/regulates the flow of gasoline from the float bowl to the venturi. Pilot jets have a precisely machined orifice/hole running through their center which gasoline passes through. Increasing the size of the pilot jet ( size of the hole ) richens the circuit by supplying more gasoline; i.e. removing a 40 pilot jet and installing a 42 richens the circuit. The slide/throttle valve has the most effect between 1/8 and 1/4 throttle with a declining effect up to 1/2 throttle. The throttle valve can be exchanged for one with a greater or smaller cutaway. The PWK equipped KDX200/220 comes equipped with a #5 or 5mm cutaway. The larger the cutaway the more air flows to the jet block/nozzle screen leaning the mixture. Exchanging the factory #5 ( 5mm cutaway ) throttle valve for a #6 (6mm cutaway) would lean the mixture. Has the greatest effect between 1/4 and 3/4 throttle. It’s attached directly to the throttle valve. As the throttle is rolled open or closed the jet needle moves through the needle jet’s bore exposing different sections of the jet needle’s profile to the needle jet’s inner bore. Six major elements determine the jet needle’s effect on fuel delivery – the diameter of the straight section, the length of the straight section, the jet needle’s taper, the clip position, the number of tapers and the length of each tapered section. The number of tapers is normally not changed from what was supplied from the factory. I’ll talk about jet needles in greater detail in the Tuning section. The main jet regulates the flow of gasoline from ¾ to Wide Open Throttle. Like the pilot jet the main jet has a precisely sized hole drilled through its center. Increasing the size of the main jet ( size of the hole ) richens the circuit by supplying more gasoline; i.e. removing a 152 main jet and installing a 155 richens the circuit. Before you consider fine tuning your carburetor there are a few things that have to be done. First, you need to install a clean air filter. Second, you need to insure the float level is properly set. If the gasoline level is set too high or too low properly jetting your bike will be impossible. A high float level will cause it to run rich and a low level cause it to run lean. You can find instructions for setting you float level here. Third, you need to fill your tank with a fresh load of premixed gasoline. Don’t go out and try to jet your carburetor with the gasoline that’s been sitting around in your jerry can for the past month. Gasoline degrades over time so you’ll want to start with a fresh batch. While I’m talking about gasoline remember that different gasoline will change your jetting requirements. If you normally run race gas, straight or use it to cut pump gas, you’ll want to be sure you have it in your tank when you head out to tune the carburetor. You also need to be aware of any potential mechanical problems that can imitate poor jetting. Eric Gorr has included a number of articles on his web site from his book “Motocross and Off- Road Motorcycle Performance Handbook”. An excellent article on carburetor tuning is included which covers this topic. Check it out here. If you don’t own a copy I’d definitely recommend picking one up. It’s chucked full of useful, easy to read information and make a great companion to your factory service manual. When making jetting changes make one change at a time and test the result. It’s very helpful to keep a log book for your motorcycle where you can log changes to the jetting, the temperature, altitude etc and the result. Over time you’ll build a jetting history of your bike that you can go back to and determine what changes you have made. I also include routine maintenance and repairs in my log book. Again this is a good method for beginners. Once you’ve gained more experience and are more comfortable with jetting you’ll start to relay more on power delivery and how the engine feels until then this is a good method. If you go back and have a second look at the parts of a carb you’ll see that gasoline delivery is dependent on throttle position and not engine speed. You’ll also notice that the air screw, pilot jet, main jet, and jet needle target specific throttle setting. With this information in hand we can easily identify which circuit is likely the cause of a specific symptom. Before you head out for a jetting session you’ll want to mark your throttle grip and housing so you can easily identify the four major target ranges. I like to use White Out but placing a piece of tape on the throttle grip and throttle housing and breaking out a marker will work just as well. With the throttle at idle and your materials in hand draw a straight line across the inner cuff of your throttle grip and onto the throttle housing. Now twist the grip to WOT and draw a second line on your grip straight across from the line on your throttle housing. Next find the half way point between the two and place a third line, this will indicate ½ throttle. Now divide the halves in half again and mark 1/4 and 3/4 throttle. Now with a quick glance you can easily determine the throttle position while jetting. Now’s a good time to stop and talk about plug reading. The color and condition of the spark plug can tell you a lot about what’s happening in your engine. You’ll be doing some runs at known throttle settings and then observing your spark plug to determine the condition of the corresponding circuit i.e. is it lean, good or rich. Ideally a professional tuner would use a variety of instrumentation and how the engine feels to fine-tune jetting. For more information on instrumentation check out Eric Gorr’s comments on “How to use carburetor tuning gauges”. This method will insure you’re in the ballpark so you can start fine-tuning. When you have more experience and are more confident in your ability to determine jetting requirements by feel you’ll start to phase out this method for 1/4, 1/2 and 3/4 throttle setting and replace it with the jetting by feel method. You’ll continue to use this method for tuning the main jet at WOT. I’ll also say that my recommendation for the appearance of a good plug is going to be slightly different than someone who is jetting a motocross bike for an experienced rider. The conditions faced by enduro riders and moto-cross riders are quite different and therefore the jetting requirements are also slightly different. Warm up the engine and go for a short ride letting the engine comes up to its normal operating temperature. Install a brand new plug that’s been properly gapped. With the new plug installed aggressively accelerate through the gears until you reach 4th or 5th gear. For best results you should accelerate up a slight up hill section to place additional load on the engine. Continue to run the engine at WOT for 20 to 30 seconds longer if there is not fear the engine is running lean. If you suspect the engine is running lean 15 to 20 seconds to give you an indication. At the end of your full throttle run simultaneously push the kill button, chop the throttle and pull in the clutch. This procedure is often refereed to as a ” plug chop”. It is important to perform a plug chop exactly as described. If you allow the engine to run or leave the throttle open for even a few seconds after the plug chop the plug reading will be invalid. Now remove the spark plug and carefully look at its color. What does a good plug look like? First you need to know where to look and what to look for. I’ve seen a lot of plug reading instruction that suggest you to look at the general appearance of the plug. That doesn’t work. The easily visible portion of the plug, the upper part of the porcelain and the electrodes, won’t give you an accurate reading. This area is mostly affected by additives in the gasoline and the oil you’re running. To get an accurate indication you want to look down inside the plug where the porcelain insulator emerges from the steal body of the spark plug. Ideally you should see a ring of light brown/tan at the lower 1/4 of the porcelain. White is lean and you’ll need to install the next richer main jet( larger number ) and do another plug reading. A dark brown to black ring is too rich and you’ll need to install the next leaner main jet ( smaller number ). A small flashlight and magnifying glass make this much easier to see and it’ll give your friends something to poke fun at. If you ride in a diverse area with fluctuations in temperature greater than 15 degrees F, and altitude changes dropping more that 3000 feet over the course of the day or you ride in high load conditions ( loose sand, mud, long steep hills ) adjust the size of your main jet until you reach the ideal condition then install the next richer main jet which should result in a dark brown plug reading. You’ll be loosing a small amount of top end power in trade for the added confidence that you can ride aggressively over the course of the day without fear of running lean at WOT. Once you have the main jet properly sized you can turn your attention to the jet needle. Warm up the engine and go for a short ride until the engine comes up to its normal operating temperature. Install a brand new plug that has been properly gapped. With the new plug installed accelerate through the gears until you reach 4th gear. For best results you should find a location that allows you to run safely at half throttle with out having to ex or decelerate to avoid obstacles etc. A long straight away or well groomed oval track will work the best. Continue to run the engine at half throttle for more than 60 seconds if possible. Do a plug chop and inspect the plug. If the plug indicates a lean condition, lower the clip on the needle by one position. Lowering the clip by one position raises the needle further out of the needle jet allowing more gasoline to flow, richening the circuit. If the plug is dark brown to black raise the clip’s position by one notch to lean the circuit. As a general rule if you need to run the clip in the top position you should install a leaner jet needle. If you need to run the clip in the bottom position you should install a richer jet needle. Jet needle selection is something of an art. Watch for an article in the near future describing PWK jet needle profiles in more detail. This method will give you a good ball park indication if you jet needle is properly sized. However due to inefficient cylinder scavenging at lower throttle settings its often little more that a ball park indication and you’ll need to fine tune by feel. Once you’re satisfied with the appearance of the plug turn to the jetting by feel method to fine-tune the circuit. Gradually roll the throttle open from 1/2 to 3/4 throttle paying particular attention to the sound and the type of power delivery. Having an experienced friend on the sidelines to listen and watch the silencer for excessive smoke is also helpful. A rich condition will result in excessive smoke from the silencer, the plug will often carbon foul and the engine will produce a sputtering/crackling sound. A lean condition will result in slow throttle response, you twist the throttle but the power delivery is lethargic and flat. A lean condition results in a tell tale booooooha sound as well. You can quickly verify a lean condition by pulling the choke half way out. Engaging the choke will deliver additional fuel to the system and the symptoms of a lean condition should clear up. There’s a little tip that’ll make changing needle clip positions a breeze. If you’re like me, you tire of wrestling the throttle valve spring and collar pretty quickly when it comes time to adjust your needle. Not to mention the first time you sent a spring loaded collar jettisoning into a dirty mound. Why is it those ” must stay clean” parts always find there way into the grim anyway? This little trick makes trail side needle adjustment anxiety a thing of the past. Run to your local tool supply store, hobby shop or what have you and pick up a hemostat. I’m not talking about the bone crushing size here, a 4 to 5 inch pair will work just great and they’ll only set you back $4 to $5. The best thing about a hemostat is its small enough to carry in your fanny pack and they apply just enough pressure to prevent the spring and collar from slipping but not enough to damage the throttle cable. Nurse, hemostat please! You can use the air screw to help determine if your pilot jet is appropriately sized. Take your bike for a short ride letting the engine come up to normal operating temperature. With the engine stopped, transmission in neutral and the bike on its stand turn the air screw clockwise until it just seats, gentle now it’s delicate and you don’t need to torque it down just gently seat it. Now turn the air screw a quarter of a turn out so the engine will fire and start it. Slowly turn the air screw counter clockwise (out) until the point where the engine just reaches the maximum obtainable rpm and continuing to turn the air screw beyond this point wont increase the engine speed (RPM’s) any further. I find it’s easier to hear the rpm increasing if you set the idle at its lowest possible position without the engine stalling. You’ll want to repeat this procedure a couple times until you’re confident that you’ve found the right spot and that the result is reproducible. When you’re comfortable count the number of turns ( 360° revolutions ) you’ve backed the air screw out to reach this point. The normal operating range is between 1 and 1.5 turns out so if you find the ideal setting is less that 0.75 turns out consider installing the next richer pilot jet (larger number ). If you find the ideal setting is more than 2 turns out consider installing the next leaner pilot jet (smaller number). Once you’re comfortable you have an appropriate pilot jet installed, you want to fine turn the circuit using the air screw. Starting with the air screw 0.5 turns out adjust the screw an 1/8 of a turn at a time until you’ve obtained the best possible throttle response between idle and 1/4 throttle. Continue to adjust the air screw until the engine’s throttle response off idle is clean with no hesitation or bogging. You can test the final results using the same method as you did for checking the jet needle this time riding in 2nd or 3rd gear at 1/4 throttle. Remember this is only a ball park indicator your goal here is to obtain the best possible throttle response not a perfect plug reading. Because jets have a combined effect over a range of throttle setting its often useful to go back and recheck your jetting once you have followed this procedure. The second time through you can broaden the throttle settings to insure there’s a good transition between one circuit and another. So for example slowly roll the throttle open between 1/2 and WOT insuring the transition is progressive and that the engine doesn’t stumble etc. Do the same between 1/8 and 1/2 throttle, 1/4 and 3/4 throttle etc. Once your jetting is set it’s not necessarily set for life. Changes in air temperature, altitude and humidity can have an effect on how your engine runs. If you captured a measured volume of air on a humid 90° F day at sea level or a cool dry 40° F day at 10,000 feet both would contain about 22% oxygen. The density and therefore the total number of oxygen molecules however would differ enough to effect the performance of your engine. For most of us changes in air temperature will have the greatest effect on our jetting. As the air temperature gets colder the air density increases. The air molecules become less active ( move around less ) and therefore take up less space. Because they take up less space more air, and therefore more oxygen, can fit into a measured volume of air as the temperature decreases. As the temperature drops the engine will begin to run leaner and more gasoline will need to be added to compensate. As the temperature increase the engine will begin to run richer and less gasoline will be needed. Again this is an issue of air density. At sea level atmospheric pressure is around 15 psi and as the altitude increased the atmospheric pressure decreases. Because less pressure is exerted on a measured volume of air as the altitude increases the air molecules are able to relax and they take up more space leaving less space for additional molecules. The higher the altitude the less air in a measured volume and therefore less oxygen present so jetting will have to be leaned to compensate. Humidity is a measure of how much water vapor is in the air. The higher the humidity the less space there is for additional molecules of air and therefore oxygen. As the humidity increases there is less oxygen and therefore the engine runs richer. Jetting that may have been spot on in the cool dry morning air may start to run rich as the temperature and humidity increase over the course of the day. 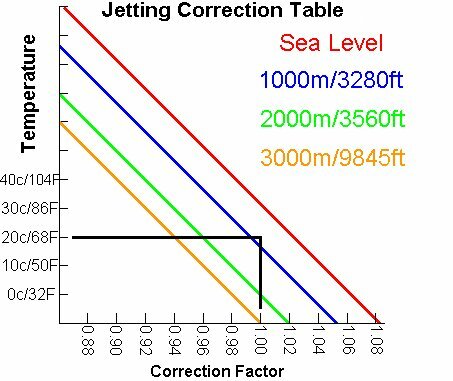 You can use a correction table to roughly determine the appropriate jetting changes to compensate for changes in temperature, altitude and humidity. I’ve included a typical correction factor chart that has been modified specifically for use with the KDX. To use the chart go back to your log book and record what jetting is presently installed in your carburetor then determine what altitude you’ll be riding at and the temperature. I’m assuming here that you’ve already optimized your jetting. I’ve used my present jetting as an example. You’ll need to slightly modify the table to fit the specific requirements of your bike but I’ll go over that in the example. Now using my personalized graph I can calculate what jetting I should install before making the trip to the mountains. I draw a horizontal line from 20° C over to 10000 ft and then vertically down to determine the correction factor of 0.95. To find the correct pilot jet size I multiply 45 by 0.95 and the new jet size would be 42.75. The closest available size is a 42 and I’ll fine-tune the pilot circuit with the air screw once I get there. I then multiply my main jet size ,152, by 0.95 and the new jet size would be 145. Now remember this is intended to give you a rough indication. Using a correction table should allow you to closely meet the requirements of changing conditions. It is however intended to be used as a guide. You should always carry an assortment of jetting in your toolbox and check any jetting suggestions you receive. At a minimum do a plug reading at WOT after changing your jetting to insure you aren’t running lean. Jetting recommendations that work well for one bike may not necessarily work for another even if it is being ridden in the same area with identical modifications. Available Keihin Jets: The main and pilot jets for your reference… I’ve included jets sizes commonly used to fine tune PWK equipped KDX’s. This includes 1988 to 2000 KDX200/220 as well as second generation KDX250s. There are larger and smaller sizes available that aren’t listed here. This list might seem rather long but it includes possible jet sizes for a number of temperatures, altitudes as well as modified cylinders. These are intended to be good jetting STARTING POINTS so use them as just that a starting point. In many instances jetting will be very close if not right on but you’ll need to insure you’re not running lean and optimize the jetting from here to meet your individual requirements. At the very least you’ll need to do a throttle reading at Wide Open Throttle and insure you’re not running lean. These jetting recommendations are intended for use between sea level and 3000ft with an average temperature of 73 degrees plus or minus 7 degrees. Stock: Run the stock R1174K jet needle in the second from the top clip position, 45 pilot jet, 155 main jet and fine-tune the pilot circuit using the air screw. With a performance pipe/expansion chamber, the air box lid removed and the stock or a performance silencer run a 42/45 pilot, R1174K jet needle in the mid clip position, a 152/155 main jet fine tune the pilot circuit using the air screw. Stock: Run a 42 pilot jet, the stock R1173L jet needle in the second from the top clip position, a 142/145 main jet and fine tune the pilot circuit using the air screw. With a performance pipe/expansion chamber, air box mods , the factory or after-market silencer and the stock 33mm carburetor run a 42 pilot, the stock R1173L jet needle in the second from the top clip position, a 145/148 main jet and fine tune the pilot circuit using the air screw. Same as above but with your carburetor bored between 35 and 36mm or running a 1988 to 2000 KDX200 35mm carb jet according to 95 to 2000 KDX200 requirements. Addition of Boyesen reeds or a Boyesen RAD Valve will require you to lean the pilot and main jet one size and readjust your air screw. Stock: Run the stock R1172N jet needle in the second from the top clip position, 48 pilot jet, 155 main jet and fine-tune the pilot circuit using the air screw. With a performance pipe/expansion chamber, the air box lid removed and the stock or a performance silencer run a 45/48 pilot, R1173N jet needle in the mid clip position, a 152/155 main jet fine tune the pilot circuit using the air screw. For jetting recommendations on remaining models ( 1982 to 1988 KDX200s ) check out Jeff Fredette’s engine performance recommendations here. If you require addition jetting help fire your question off to the JustKDX Forum. You’ll need to include the following information; year, model, modifications ( things like after-market reeds, pipe, air box lid mods, silencer, ported cylinder etc etc. average riding conditions, air temperature ( don’t submit a range between 5 and 85 degrees F you need to beak it down into your present condition within 10 degrees C or about 15 degrees F. ) altitude and average humidity.